An internal service document recently leaked from within Apple states that no-one but company staff and Authorized Apple Service Providers (AASPs) can repair or replace most MacBook 2018 and iMac Pro components without the devices becoming inoperable. However, iFixit has claimed to have done so with a MacBook Pro - and nothing happened. Apple is trying to stop individuals and third-party repair services from fixing devices bought from the company, according to new reports. They are based on an alleged leak from the Cupertino giant that states that any repairs conducted on new MacBooks and iMac Pros without Apple's 'authorization' will be bricked. According to this leak, which is described as an internal Apple service document, these repairs are detected using the Apple Service Toolkit 2 (AST2). The rationale is that only Apple's own workers and Authorized Apple Service Providers (AASPs) have access to AST2, and run it after a repair to signal to the company's Global Service Exchange (GSX) server that new parts are compatible with the machines. Otherwise, the re-assembled computer stops working. The ability of the repaired Mac to keep working is apparently controlled by the T2 co-processor, which was introduced in Apple devices this year in order to control security features such as Touch ID. However, the popular electronic-repair DIY blog iFixit thinks otherwise. It has released a post in which it asserts that its group members bought a brand-new 13-inch MacBook Pro (with touch bar), disassembled it and replaced its display with that of iFixit's original torn-down MacBook. The device was reported as working fine afterwards. iFixit also claims to have swapped the logic board in this machine with no issues. As AST2-protected repair is thought to apply to the board, display, Touch ID module and upper case of the 2018 MacBook (in addition to the flash memory and logic board of the iMac Pro), the leak may not be as worrying as it appears. 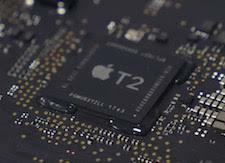 On the other hand, iFixit also speculated that a future software update could cause the link between the T2 chip and AST2 to kick in. Also, as it is directly paired with the co-processor, tinkering with Touch ID in the affected devices may also be more likely to set it off (should it exist). All in all, it leaves a lot of uncertainty for MacBook and iMac Pro owners who lack access to official Apple repair for one reason or another.